Alisa Hendrix (M.A. ’15) is a long-time resident of Bloomington, IN, where she has a history of small business ownership, volunteerism and civic leadership. 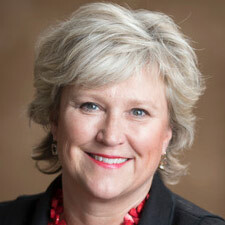 She is a member of the Indiana University Foundation Board of Directors and is a leader in Women’s Philanthropy for IU. She is a founding member and immediate past Co-Chair of the Women’s Philanthropy Leadership Council, serves as a member of the Committee on Directors and the Long Range Planning committee for IU Foundation, and is a long-time steering committee member and past co-chair of the IU Colloquium for Women. She serves on the Board of Visitors for the Lilly Family School of Philanthropy where she completed a master’s degree in 2015. She is a member of the IU Foundation Presidents Circle, a David Starr Jordan Associate of the IU Foundation Well House Society, and a lifetime member of the IU Alumni Association. Alisa is an active leader in the Bloomington community, serving as Director of the Community Foundation of Bloomington and Monroe County where she is a member of the Executive Committee and co-chair of the Grant Program. She is a former director of the Bloomington Hospital Foundation and currently serves on the Investment Committee. She is a long-time volunteer for Kappa Alpha Theta, serving as a chapter advisor, event chairperson and is a past president of the Bloomington Alumnae Chapter. Her community interests include philanthropic education, early childhood education, mental health, and community development. Alisa has two children, Chad Sutor, who is a May 2012 graduate of Purdue University, and Jennie Sutor, who is a May 2017 graduate of Indiana University Bloomington.